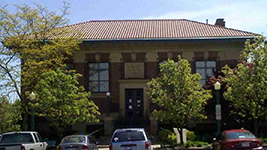 The Herrick Memorial Library Endowment Fund represents a long-term effort to provide a permanent, stable source of funding to enhance library collections, services, and programs in the library’s service area. The fund is governed by the Library Board of Trustees. The Endowment Fund is established within the Community Foundation of Greater Lorain County and is subject to the governing rules of the Foundation. Contributions to the fund are deposited with the Foundation and held separately for the benefit of the library district. Contributions to the fund are professionally invested, and only the income generated by its investments will be spent each year. Contributions may be made in many ways, including: Gifts of cash, securities, or property; memorial gifts; deferred gifts, made in planned stages over a period of time. The Friends of the Herrick Memorial Library are now on Amazon Smile! Amazon Smile is just like Amazon.com, but at Smile you can choose Friends of the Herrick Memorial Library Inc for your charity and Amazon will donate 0.5% of your eligible purchases to them at no cost to you. If you would like to participate, instead of visiting the usual Amazon site go to https://smile.amazon.com/ and simply log in with your normal Amazon account. Your account will work across both sites simultaneously, and you can shop on either as you see fit, but you must make purchases on the Smile website if you want Amazon to donate to your charity. This includes Kindle e-books, but you must buy them from the Smile website to get the donation, not from the Kindle device or Kindle app. If this is your first visit to Amazon Smile you will be asked to choose a charity organization. In the search box type in “friends of the herrick memorial library inc” and this account should pop up for you to select. You can see your chosen charity at the top of the screen while shopping on the site, it should say “Supporting: Friends Of The Herrick Memorial Library Inc”. If you need to change your chosen charity you can find the Change Your Charity option under the Your Account menu on the right side of the page near your shopping cart button. This will allow your Amazon purchases that you make anyway to support your local library through our Friends organization. Thanks for participating!